How did card tournaments start? Do you know how and why were tournaments created? The roots of this kind of competitions reach out to medieval times. When chivalrous competitions were held amongst the knights in Europe in the Middle Ages and the Renaissance. In the beginning, they were made mainly for entertainment and weren’t intended to be violent or dangerous. They were supposed to be a test of skills, technique, and talent. Regardless of that many tournaments resulted in injuries and even fatalities. Of course, when talking about card tournaments there are no such treats. All card games can actually be described as mind sports. Which means that they are games of skill based on a particular type of intellectual ability. The first ever major international competition of this kind was the Mind Sports Olympics in 1997. During this event, the mental skills of the participants were celebrated and the best were awarded gold, silver and bronze medals. From its beginning until now many games have been added to it. The main ones being: chess, bridge, draughts, shogi, backgammon, Chinese chess (xiangqi), Othello, poker, cribbage, Mastermind. Why are card tournaments important? Have you tried thinking of a strategy about how to play and win in a game of cards? If you play against the computer you can’t really progress, as it plays in a specific way. Yes, you will soon start winning against it, but as it can’t learn from its mistakes and can’t really change the way of its game, you won’t progress much further. In order to become better, you need to play against real players! Playing against real opponents and winning gives you confidence! If you want to learn how to play a game faster you should play with real players. That way you will advance faster into the game atmosphere, you will learn the rules of Spades faster, you will know what to do and what not to do. Most importantly it will motivate you to become more creative in inventing a strategy of how to play and win the game! Once you have all of that and you become really good you should definitely try your skills in a tournament! That is the place where you will find the best card players. Playing in such kind of competitions will make you face many skilful opponents and winning it will give you the sense of the accomplishment of overcoming a tough challenge. Even if you lose, it will be only in your favor, because you will learn something useful out of this. Remember one thing: Never imitate your opponents. This way you won’t win! You must observe how they play, learn from that and perfect your own strategy in accordance. The important thing about card tournaments is that you will gain a lot more experience quicker. Last, but not least, entering a tournament will allow you to meet lots and lots of new people. You will gather knowledge and even make new bonds and friendships with them! This is a type of contest divided into successive rounds. If you lose even once you are eliminated from the tournament. 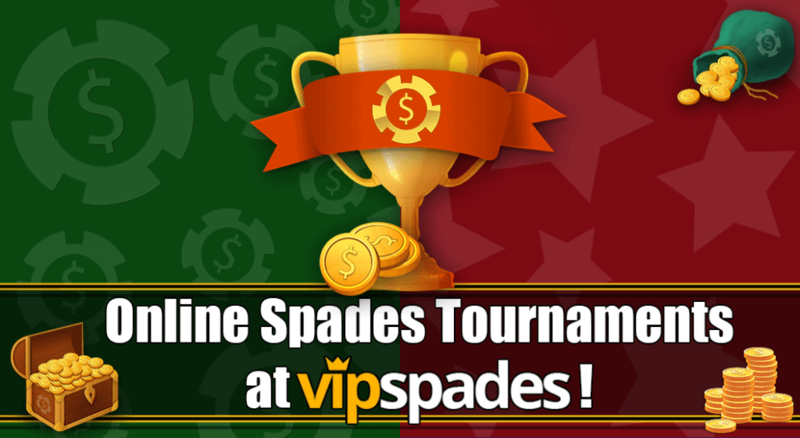 This is the kind of tournament we use at VIP Spades and is also used sometimes for poker. In this kind of а tournament, you need at least two defeats in order to be eliminated. This way you get the chance to prove yourself one more time if you were defeated in the first one. There are poker tournaments that allow you to buy this second chance for yourself and try your luck again. It consists of each individuals meeting all other individuals in turn. In the end, the one with most victories wins the tournament. This format is used in bridge tournaments. This is a non-eliminating tournament with a set number of rounds. The Competitors meet each other one-to-one in every round. They are paired using a set of rules designed to ensure that each competitor plays opponents with a similar running score. This one is used for shorter bridge tournaments. For the online spades tournaments at VIP Spades we picked the knockout format. So let’s get into more details about what does knockout tournament means. Spades is usually played as a partnership game. This means that when you are entering a spades competition you will probably have a teammate. As this type of contest is divided into successive rounds, if your team lose a round, you will be immediately eliminated. If you win, you will be matched with another team and you will play against them in the next round. Depending on how many teams there are, there may be a different number of rounds until the final match-up. At VIP Spades there are two types of online spades tournaments. One with 16 players called Classic Tournament and one with 8 players called Quick Tournament. As it follows the knockout tournament stages also vary. In the first case, there are 2 stages, in the second – 3. Once the competition is over and there is only one team left, the become the tournament champion. Let’s take a look at the Classic Tournament. The first round starts when 16 players gather. This means that when the tournament starts, there are four active spades games. When the first round ends, each game presents one winning pair, which goes to the next knockout tournament stage. In total there are 8 players left and there are two spades games that begin. The same thing repeats again and for the final round, we have 4 players left – the winners from the two games in the previous round. In the end, the two players that win become the tournament champions. They receive a reward which is equally divided between the two players. There is also a reward for the runner-up. What are the benefits of entering an online tournament platform? The main one is that it is as easy as pie to join it. The only things you need for that is a computer/phone and Internet access. Online tournaments allow everyone to play their favorite card game from home. No matter where in the world they are! If you participate in an online tournament competition you will play against skilful players, from different places and with different styles of play without spending any money and time on travels. Tournaments with online entry usually use virtual currency named in different ways like chips, diamonds, etc. You get some at the beginning when you register on the platform and then you can multiply it by winning games. Of course, this is if you want to play for fun. If you want to earn money you will have to spend some starting cash. Another thing about online games with tournaments is that you don’t need to take your time and fill thousands of papers. All you have to do is click a button and wait for the other players to gather. It’s a lot faster and easier to enter this kind of competitions than real life ones. Also, the game itself passes faster as there is a set time for every player’s move. In conclusion, we can say that online card game tournaments are the future. They grant us the option of playing against skilful players from all around the world and to perfect our skills without leaving the comfort of our home.